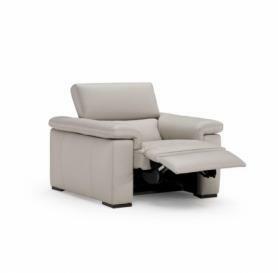 Combining family comfort, a neatly tailored padded arm and pull up headrests with cool contemporary styling the Natuzzi Editions Panama is a fusion of high style and practical design. Clean simple lines and shapes make this a very attractive suite either as a corner suite or three and two seat combination. 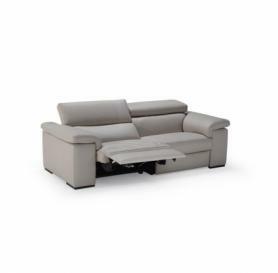 Fixed or motion recliner options are available as well as modular corner versions meaning this sofa set can be tailored to suit the users space. Pull up and even electrically rising headrests ensure maximum comfort experience. The reclining actions featured on the sofa set are are "Wall away" design meaning no space is required behind the sofa. A huge choice of fabrics or leather can tailor the suite to your lifestyle choice. Click the PDF icon on the right to download the datasheet for the Natuzzi Editions Domenco. Sofas from the Domenco range can ordered and tailored to your specific requirements. Available in a range of sizes, leathers and fabrics.